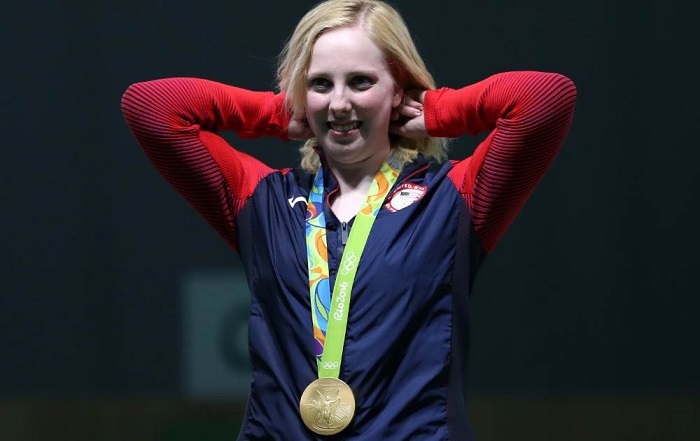 America's Virginia Thrasher win the first gold medal of the Rio Olympic 2016 Games, showing nerves of steel to claim the women’s 10m air rifle event on Saturday (6 August) morning. Thrasher won the gold medal with a finals Olympic-record score of 208, ahead of Du Li of China, who had been dominant in qualifying, setting an Olympic record of 420.7. Thrasher's performance was a big surprise, as she is ranked 23 in the world. Thrasher beat two-time gold medallist Du by one point. The 2012 Olympic champion, Yi Siling of China, claimed bronze. Earlier this year, Thrasher became the first freshman to win both individual NCAA rifle titles and helped West Virginia win the team title. She followed that by winning the US Olympic trials less than a month later, earning a trip to Rio. Thrasher only entered the Olympic trials with the goal of doing her best, not making the Olympic team. "To me, it was just another match to try and do my best. I wasn't really worried about the result. This is beyond my wildest dreams."